In that miraculous catalogue of songs written by Frank Loesser, “Heart and Soul” (1938) might not be counted among the masterpieces. Loesser wrote only its lyrics, to an endearingly, maddeningly mesmerizing tune by Hoagy Carmichael. The lyrics – a surprise to almost anyone who has pounded out the melody on a piano – tell you a lot, though. They seem artless, at first, direct, inevitable, a clever laundry list of deep romantic sighs that synchs perfectly with the gentle swagger of the melody. It’s the “perfectly” part that grabs you. Once you hear the lyrics, it is impossible to hear the song the same way again. Loesser’s words aren’t artless. They just seem that way, because they land as deftly, as accurately, as Cupid’s arrows. And with a cheeky grin that adds to the glow of the song’s title. 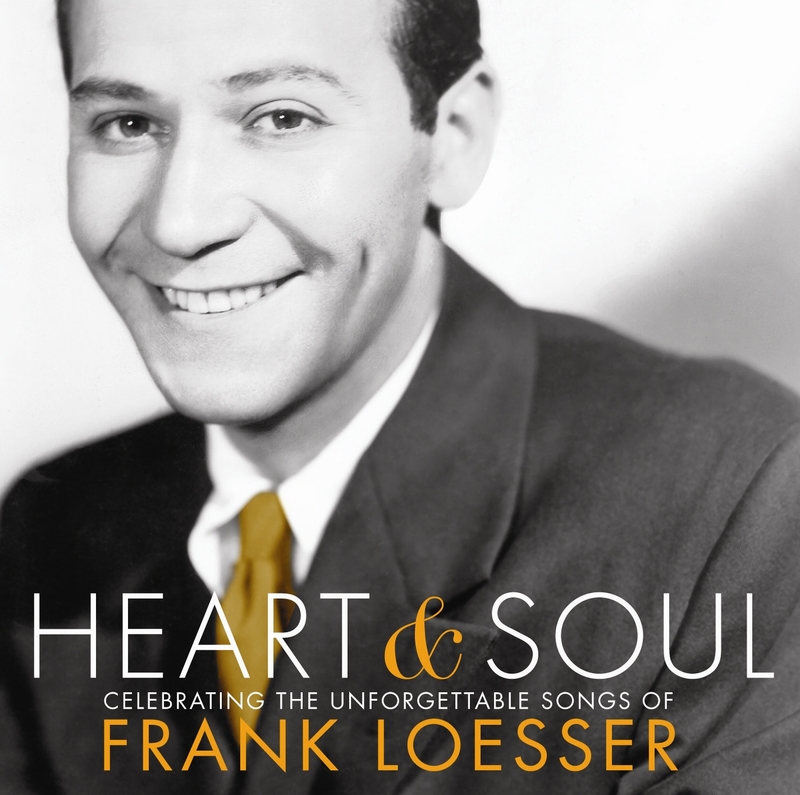 There may be no better shorthand for Frank Loesser’s genius than the words “heart and soul.” They never deserted him, from the dapper hit-parade favorites he wrote for Hollywood, to his ambitious Broadway career that produced – in little more than a decade – Where’s Charley, Guys and Dolls, The Most Happy Fella, and How To Succeed in Business Without Really Trying. A complex and sophisticated man, Loesser somehow managed to keep the essence of “heart and soul” in everything he wrote, without ever seeming glib. His craft deepened and broadened, but it never lost an almost streetwise honesty that is as dazzling and sharp as a diamond. You never feel cheated or manipulated in a Frank Loesser song. Seduced, maybe. Teased and kidded, certainly. Moved, almost always. And joyously entertained. A native New Yorker who tried to make it on Broadway in the early 1930s, Loesser perfected his skills in Hollywood, writing for the movies, at first in partnership with composers as impressive as Carmichael, Burton Lane, Jimmy McHugh, and Jule Styne. The second song he published as composer and lyricist – the morale-boosting “Praise the Lord and Pass the Ammunition!” – was just what Americans needed to hear in the dark days of 1942. That success encouraged him to break away from collaboration, to develop a musical craft exclusively for himself. He returned to Broadway in 1948, and this time he was ready to step up. The show, Where’s Charley, was a hit, and his enchanting score was a principal reason why Loesser had begun to chafe at a lack of control over his work in Hollywood, and at the limitations the studio process placed on him. Broadway offered him the opportunity to write Frank Loesser songs, for Frank Loesser shows. He kept his ties with Hollywood for a while, finally winning an Oscar in the spring of 1950 for the song “Baby, It’s Cold Outside,” and returned once more to write a magical score for the 1952 Danny Kaye musical film Hans Christian Andersen. But the die was cast. A few months after Loesser’s Oscar was presented to him by no less than Cole Porter, his new musical Guys and Dolls opened on Broadway. A triumph in every sense, it is one of a handful of “perfect” musicals – like Oklahoma!, Carousel, My Fair Lady, Gypsy, A Chorus Line, and Sweeney Todd – that seem only to improve with time. Guys and Dolls has a brilliant book, based on rich source material from the stories of Damon Runyon, but Loesser’s score is the element that makes it great. Why? Perhaps because you don’t think about craft or art when you hear them. The melodies are as clever, as catchy, and as provocative as the words. They are inseparable, once you hear them. What you think about, though, is who is singing and why, because they are singing something so … right. You can’t get the songs out of your head. This was just as true in Loesser’s next effort on Broadway, The Most Happy Fella, a big, romantic show (he wrote the book as well as the score) that transfigured the musical into something close to – without quite being – opera. The similarly ambitious Greenwillow (1959) followed, another show for which he wrote the book and score; this time Loesser tasted failure, if it was a noble one. His next move, if a little grudgingly, was to collaborate once again, with his colleagues from Guys and Dolls. The show was How to Succeed in Business Without Really Trying, driven by a richly satirical but affectionate Loesser score that caught the zeitgeist with, to quote its irrepressible hero, “the slam-bang tang reminiscent of gin and vermouth.” Loesser became only the fourth Broadway composer or lyricist to share a Pulitzer Prize. Frank Loesser died tragically early in 1969, at a time when musical theater had begun to lose the good will of the masses. He missed out on the revival a generation later, on things like Kennedy Center Honors and career retrospectives, on the enduring life of his greatest work. The odd thing is that he still seems very much alive, because the timeless wit and wisdom and the rich human wonder of his songs have only deepened, whether in an exquisite, aching ballad like “Spring Will Be a Little Late This Year” or “I Wish I Didn’t Love You So,” or a zesty show tune like “Standing on the Corner” from The Most Happy Fella, or “I Believe in You” from How to Succeed in Business Without Really Trying. A hundred years after Frank Loesser was born, his songs still “land.” We can marvel at his craft and study it. But we still listen to the songs as we always have. Heart and soul.